I can think of few more enjoyable ways to spend a lunch hour than oohing and aahing over the upcoming releases from MAC. Landing first, next month in fact*, is the limited edition Fashion Sets collection so I got snap happy to show you guys what's what. MAC first introduced the concept last year and we went wild for matchy matchy eyes, lips and nails in the strongest colours of the season. This year we'll have four punchy, modern shades to choose from - the orange apricot Ablaze, fuchsia flash of Embrace Me, electric violet of Heroine and, last but not least, the shocking pink of Silly. Each will be available as an eye shadow (€15.50), nail laquer (€12.50), matte lipstick (€18), cream lipglass (€17.50) and lip pencil (€15.50). I'll definitely be snapping up one of the lipsticks - probably in Silly - and maybe an eyeshadow or two, but I'm not sure yet if I'll go for a full matching set. What do you reckon, do you have your eye on anything from the collection? Ahhhh love the colours! I hope they make their was to Australia as well. I will have to keep an eye out in May. I'm with you - the pink 'silly' colour looks the best. wow amazing, love the bright colours! Super gorgeous colours, will definitely be shopping this range! I love the look of the ablaze lipglass, it may have to be mine!! I am completely enamored by those vivid shades of pink lippie, Must, Have! How jazzy that you got to see the new colors! Loving the look of that coral lip glass! 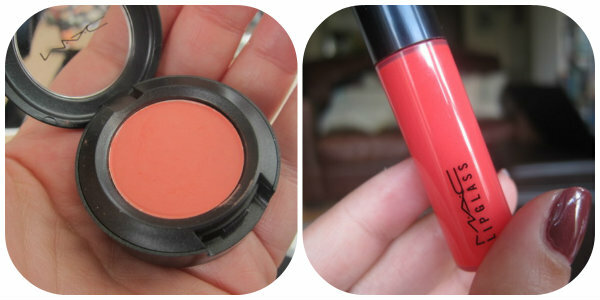 I'm in love with Ablaze, I'm all peachy lately! You always provide the hottest news dear! !